Overview - What is ntdll.dll? Ntdll.dll is arguably one of the most important files on your Windows computer. It contains NT kernel functions and is a Windows system file. You should never delete your ntdll.dll file, as it's an integral part of your Windows operating system and is called by many programs and processes. If your ntdll.dll file becomes damaged or corrupted it's possible your operating system will freeze, become unstable and completely stop working. Problems with an ntdll.dll file can manifest itself in many ways. 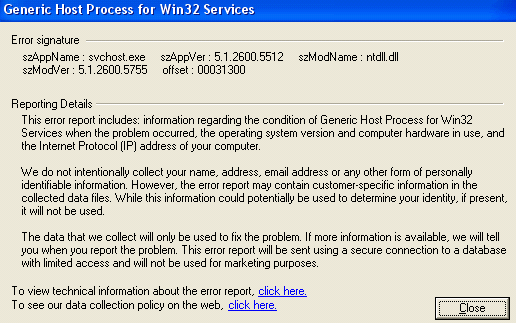 You may see STOP error messages such as "STOP: C0000211 unknown hard error - /windows/system32/ntdll.dll". Programs may also crash or fail to start. Windows may refuse to start up properly, and may hang during start up or shut down. There are many reasons why you may see an ntdll.dll fault, as there are many processes that call this file, such is its importance in Windows. Most errors are the result of a corrupt or missing ntdll.dll file, however you may also find that corrupt hardware drivers also generate an ntdll.dll error message. If a device in your computer is malfunctioning, you may also see ntdll.dll errors as the drivers for that device try to call the DLL file. Firstly, if you're receiving an ntdll.dll error after installing a specific piece of software, it's possible that this process has damaged or corrupted your ntdll.dll file. Uninstalling and then reinstalling the software may solve the problem for you. If you've just added a piece of hardware, turn off your computer and remove the device to see if that solves the problem. If the ntdll.dll error message only appears when you run a specific program, reinstall that program to solve the problem. You may need to uninstall first, reboot, and then reinstall before the error message stop occurring. Older versions of ntdll.dll were subject to a security risk, but this was solved by security updates issued by Microsoft. Make sure your service packs and security updates are completely up-to-date by running a system update. Sometimes when using Microsoft Internet Explorer 8, error messages regarding ntdll.dll is generated when accessing certain third-party add-ons to the browser. In this case, try removing any third-party add-ons, particularly if you only receive the ntdll.dll error messages when using Internet Explorer. You should update any hardware drivers for devices attached to your system. This is particularly true for any devices that have recently been added, or if the ntdll.dll errors only appear when a certain device is attached. If you have a corrupt or missing ntdll.dll file, you can repair or replace the file by using the Windows repair software. This will replace the ntdll.dll file with a working version.